With The Swing Check attached to the knob end of the bat, swing as you normally would. The goal is to not let The Swing Check hit your body. If a quality swing is made The Swing Check should never contact the user's body. Hand Path – a common trait to being a consistent and powerful hitter is staying inside the baseball. If The Swing Check hits your body early in the swing, you're casting your hands or swing "around the ball"
Rotation – proper rotation of the lower body and upper body in unison with the hand path create the optimal angle of approach to the baseball. If The Swing Check hits your body mid-swing, there is lack of separation between the upper half and the lower half. Extension – great hitters create a high extended finish which is a result of inside hands, proper rotation, and an optimal attack angle. 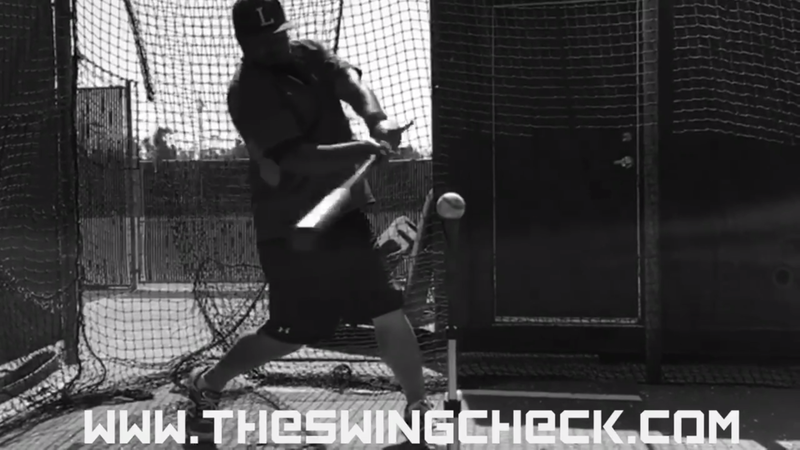 If The Swing Check hits your body late in the swing, there is lack of extension of the barrel "down the line".